Somehow, it’s been five years since I last saw The Weakerthans live. No excuse, they’ve been through town lots of times. I’ve just never gone. Which is weird, since I really do like them and think John K Samson is one of the top songwriters this country has to offer right now – the fact that his band also rocks out is gravy. But as their headlining show at the “From The Peg” festival at Harbourfront (celebrating the city of Winnipeg) showed, it has been far far too long. Fittingly, Samson opened the show solo with the affectionate and ironic ode to his hometown, “One Great City!”. But once joined onstage by the rest of the band the Weakerthans ratcheted up the tempo for the next hour fifteen with selections from all three of their records and a handful of new songs which will hopefully see the light of day sooner than later – it’s already been three years since Reconstruction Site. While the grinning Samson mostly played the shy boy frontman, his bandmates were a whirling rock machine, striking poses, doing windmills, the whole bit. I know it’d been half a decade since I’d seen them last, but I really don’t remember them being such… extroverts. Samson did step up on a riser for his one guitar solo but for the most part, was content to let his words speak for him. It’s amazing that a band that at first listen sounds so straightforward can actually possess so much depth. You could call them emo-punk, power-pop or indie-rock and they’d be all reasonably accurate descriptors but at the core of it all, Samson is really a folk singer and poet of the people. Maybe because he grafts them to music so simple, energetic and melodic they can get overlooked but Samson’s lyrics are some of the most splendid in contemporary music. Whether channelling a cat concerned for its owner or an Antarctic explorer, his words are never less than literate, wry and warm but never come off as overly-earnest, pretentious or cloying. He’s got an almost unnatural gift in his ability to capture in words the frailty, poignancy and very essence of the human heart. I know how high-faluting that probably sounds but it’s true. I don’t know if the show necessarily convinced me to book my next vacation for Winnipeg, but it did remind me that The Weakerthans are a band I always forget how much I love until I hear them. Almost without fail, if I listen to one album I need to hear the other two straight after before I can move on. It surely won’t be five years before I see them live again. See gig photos here and read the The Globe & Mail piece where talk to Weakerthans guitarist Stephen Carroll about being Winnipeg icons. Billboard talks to Eric Bachmann about creating To The Races, his solo album due out August 22. I got a copy of this last week and can say without hesitation that if this is what living in a van does for your creative muse, everyone should do it. It’s an amazing record. He’s at the Horseshoe on September 16. This month’s Exclaim! cover story tells tale of The Sadies, country music and their live album In Concert, Volume 1, out August 8. Tickets for the Sadies’ shows at the Horseshoe September 8 and 9 are now on sale for $15. JAM! talks to Kathleen Edwards about gearing up for her third album. Filter breaks news of Swan Lake, a new project featuring Dan Bejar (Destroyer/The New Pornographers), Carey Mercer (Frog Eyes) and Spencer Krug (Sunset Rubdown/Wolf Parade). Why do I get the feeling that there’s going to be yelping on this one? 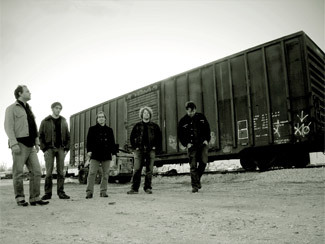 Couple show announcements – …And You Will Know Us By The Trail Of Dead (Trail Of Dead to their friends) are at the Phoenix on November 5 with The Blood Brothers and Gang Gang Dance are at Lee’s for a Hallowe’en show October 31. 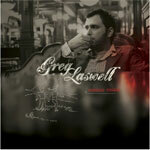 It’s no secret that I can be a little tough on singer-songwriter types, so when I say that San Diegan Greg Laswell’s new record Through Toledo really impressed on first listen, that’s saying something. Written, performed and produced entirely by Laswell, Through Toledo is a lovely slice of adult-ish pop. Heavy on melancholy but also hooky and melodic and able to range from delicacy to rocking out without ever sounding forced or overwhelming Laswell’s emotive, weary rasp. There’s actually something very Coldplay-ish about this record, but only in a positive sense – replace Chris Martin’s empty platitudes and arena rock gestures with real emotional depth and intimacy, for example. I’m actually somewhat surprised how much I’m enjoying this record, but I do/am/whatever the gramatically correct way to end this sentence is. Laswell plays the Horseshoe on August 16 with ex-Jayhawk Tim O’Reagan. It’s a free show – there’s no excuse not to check it out. High school band geeks owe Sufjan Stevens a debt of gratitude. By making earnest, orchestral indie rock cool, he’s opened the door for bands like Mount Pleasant, Michigan’s Anahtallo to do their thing which is, well, earnest, orchestral indie rock. But while part of what makes Stevens’ work so appealing is how he tempers the musical lushness with a necessary amount of understatedness and irony, Anathallo are deadly serious in a way that only kids just out of their teens, and who used to be (or still are) emo kids, can be. 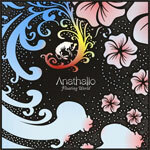 And if you thought that an album for each of the fifty states was pretentious, consider that Floating World is a concept album based on a Japanese folk tale. But also consider that I am a grumpy old man and don’t understand kids these days and their music. Anathallo are at the Opera House August 5 with The Format. The weepy pedal steel guitar and fiddles that permeates this record certainly says country, but there’s something bright-eyed (not Bright Eyes) and optimistic about Matthew Carlson’s voice that won’t let The Pantones sob into their beer. Gram Parsons is an obvious reference point and Carlson certainly knows and embraces it – consider the title of this album and of their debut, Cosmic Americana. But it’s sort of refreshing to hear someone willing to wear their influences on their sleeve, and The Pantones certainly do that. Clean, polished Americana is the order of the day and The Pantones serve it up in spades and serve it with a smile. Scotland’s Delgados hung it up a year ago, which would make about now the proper time for an attic-clearing collection of singles, b-sides, rarities, etc. The Complete BBC Peel Sessions is not that collection, but instead as the title suggests, a collection of all the band’s sessions for the late, great BBC DJ who was a huge fan of the quartet, as well as an early session for Radio Scotland. And for those, like me, who already have the similarly-titled BBC Sessions disc, fear not – only five of those eleven tracks are duplicated on the new comp. It’s not wholly redundant. Yet. Over two discs and 29 tracks, it covers the breadth of the band’s career from their first single through to the swan song of Universal Audio and combined with the expansive and enjoyable liner notes by bassists Stewart Henderson, offers a very good overview of the career of a band that never quite got the due it deserved. It’s amazing how much a leveling of production can affect the songs across a band’s career – the older songs are still scrappy but more polished while the Great Eastern and Hate-era material sounds spare and stripped down without the Fridmann touch. But perhaps most interesting is how consistent the band sounds – even though they went through some serious stylistic and songwriting-style changes, you could easily put this collection on shuffle play and believe that whatever combination came out was off the same record. This isn’t meant as a slight or to suggest they didn’t grow, just that they had a certain uniqueness of sound and creative vision that was there from the get-go. As for what the band members are doing a year hence, they continue to run Chemikal Underground records and both Alun Woodward and Emma Pollock are pursuing solo careers. Nothing of Alun’s work has come to light yet but Emma has a deal with 4AD and an album due out sometime this year. A demo is streaming off her MySpace page. 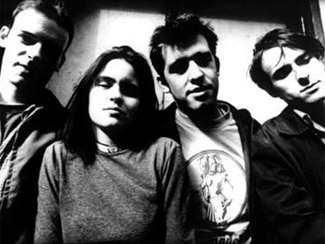 The Chemikal Underground website has a couple of Delgados goodies for download – one is an acoustic, Emma-only demo of “I Fought The Angels” from Universal Audio and a musical rendition of Robert Burns’ poem “Parcel Of Rogues”, arranged and recorded for a Burns Night special broadcast and which also appears on The Complete BBC Peel Sessions. There’s also a video for “Everybody Come Down”, again circa Universal Audio. Continuing on with the retrospective angle – a Mercury Rev collection called The Essential Mercury Rev: The Weird Years 1991-2006 will be out in the UK on October 2. Considering it covers the many incarnations of the band, from the psychedelic sonic anarchy of the David Baker era through the polished dream-pop of the Jonathan Donahue records, it should be an interesting if jarring listen. Meanwhile, fellow psych-vets (as in veterans, not veterinarians) The Flaming Lips are putting together a live record, due out for release next year. The idea of a band that is far more interested in the spectacle of a live show than the musical performance releasing a live album is interesting to say the least. Good thing it comes with a DVD. Billboard has more. And if you (I) weren’t feeling old enough with favoured bands being boxed up and compiled, observe this new compilation from Sanctuary Records – Like A Daydream: A Shoegazing Guide, a collection of noise and effects pedal fetishism covering the big guns to the also-rans. Obviously not comprehensive – it’s just 16 tracks and no My Bloody Valentine, but not a bad sampling. Maybe I can get a copy and just let it run at the Shoegaze Tribute Night at The Boat on August 23, which I’m apparently DJ-ing. More on that at a later date. But what I want to know is, is this collection a replacement for the Shoebox box set that Andy Bell mentioned a couple years ago? I hope not, though considering that Sanctuary is drowning in red ink, I doubt a box set with questionable sales appeal is on their schedule anytime soon. Alas. Here’s a pleasant trend – record label blogs. Both Merge and Matador have dived headlong into ye olde blogosphere in the past week, launching the Merge Blog and Matablog, respectively. 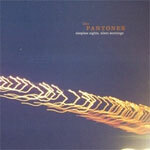 It should be noted that the honchos for each label, Mac McCaughan and Gerard Cosloy, also have their own blogs – Portastatic and Can’t Stop The Bleeding. Mac’s focuses on but isn’t limited to his musical project of the same name whereas Gerard’s is heavy on sports. So I’m going to Lollapalooza next weekend. A last-minute thing thanks to one of my sponsors but instead of seeing Land Of Talk, Starflyer 59 and Husky Rescue here in Toronto over the long weekend as I planned, I will be seeing Sleater-Kinney, The Flaming Lips, Sonic Youth and, well, Husky Rescue in Chicago. Woot. Bringing along a so-called buzz band along to open for you on tour can be a two-edged sword. On one hand, it makes your show that much more attractive to the hipster crowd and surely helps attendance but on the other hand, you run the risk of half the crowd leaving before your set or even worse, being upstaged by the support (assuming the buzz is well-founded). That was a risk that Sunderland, UK’s Futureheads seemed willing to take when they invited Minneapolis blog darlings Tapes’N’Tapes along to open a leg of their North American tour in support of sophomore effort News And Tributes. The Tapes’N’Tapes bandwagon is not one that I’ve bought a ticket for yet. I tried to catch them at SxSW earlier this year but the buzz was already strong enough at that point that the club was beyond full and spilling out into the street. I’ve heard The Loon a couple times and it didn’t really make a huge impression one way or another. In other words, this would be their big chance to impress – and they did. All the press that compares them to Pavement is really misleading – yeah, there’s some similarity in the elliptical lyricism and guitar work, but whereas Pavement really did what they could to earn their title of slacker kings, Tapes’N’Tapes were anything but slack – quite the contrary, they were tight and taut and more than a little fierce. There was bounding around the stage, neck veins bulging, tubas wielded with reckless abandon… All around pretty impressive. I will have to give the album another listen – maybe sometimes bloggers get it right. Who’d have guessed? I’d call myself a mild fan of the Futureheads. Got and enjoy the first record, haven’t gotten around to hearing the second one yet. But I’ve heard they put on a good show so what the hey. The bar had been set fairly high by the openers but luckily for the ‘Heads (and the audience) they were up to the task. With their super-tight, four-part harmonies, jaggy guitars and boundless energy, the Futureheads kept up an exhaustingly uptempo pace over the course of their hour and change set. I was reminded why I don’t play The Futureheads all that much – it makes me tired! But the band were gregarious and entertaining, and even the “Hounds Of Love” audience singalong, though cheesy, was fun. The crowd, at least those that didn’t leave after the openers, were into it and I daresay a loverly, if sweaty and wearying, time was had by all. Gig photos here. 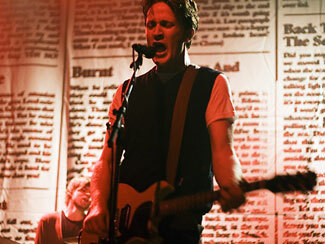 Media below, and also check out this AOL session with the Futureheads and Minnesota Public Radio session with the Tapes. 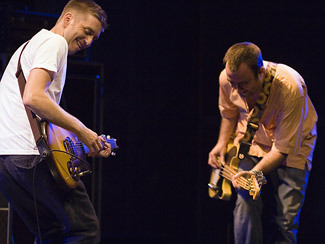 Also, Bradley’s Almanac has the Futureheads show in Boston earelier this month MP3-ed and ready to download. Exclaim! also has a piece with Tapes’N’Tapes where they dispute the whole Pavement thing and The Chicago Tribune gets head ‘Head Barry Hyde to predict the future. With his head. Torontoist has also got an expansive (if less precognitive) interview with Barry. Sloan’s new album Who Taught You To Live Like That will be out September 19 and will apparently clock in at a mighty 29 songs which either means a double album or really short songs. With that many tunes, there’s no excuse to not have the songwriting duties evenly split and that’s what they’ve done – good news for Andrew Scott fans since he was shut out of 2003’s Action Pact. The first single and title track (a Jay Ferguson composition) is streaming on their MySpace and was a free download from iTunes Canada last week. Look for a New Pornographers date in Toronto this October as part of Exclaim! and Mint Records’ 15th birthday tour. They’ll be bringing Immaculate Machine and Novillero along for the ride. And suave Frenchmen Phoenix have scheduled a show at the Mod Club for September 8. Via For The Records. Keeping up with Jason Molina’s various projects is a full-time job, and thankfully it’s not mine. I’ll leave that to Wikipedia. But while he could very well have a million records complete and ready to release under whatever name he so chooses, what is fact is this – Let Me Go, Let Me Go, Let Me Go is a vinyl-only release under his own name coming out August 22 and it will be followed very closely on September 12 by Fading Trails, a new proper Magnolia Electric Co album pulled together from a number of different recording sessions in a number of different places. According to this message board thread, it pulls together tracks from some/all of the albums mentioned here. Now what this means for the stated plans to release those albums in their individual entirety, I have no idea. Where Molina finds the time to record all this material and tour as much as he does is a mystery to me. The Magnolia Electric Co is currently on tour out west (for which MEC guitarist Jason Groth is keeping a tour diary at Marathonpacks) and after taking a breather in August (probably to record), will be back on the road in September through eastern and central North America. The Toronto stop will be at Lee’s Palace on September 12 and feature a very very solid bill including Shearwater and Julie Doiron. But one of the upsides of his prolificacy is downloads. There’s lots and lots of downloads. Secretly Canadian has select cuts from many of the Molina projects they’ve released available to download, there’s a couple more unreleased bits on their MySpace and the official website has a massive live show archive. And here’s a couple samples of the new forthcoming records. And at the polar opposite end of the musical output spectrum is Mark Linkous of Sparklehorse. Five years it’s taken him to follow up It’s A Wonderful Life though I suppose I should be thankful that he has at all. Billboard talked to Linkous about Dreamt For Light Years In The Belly Of A Mountain, out September 26, and there’s a new song from the album streaming off the official MySpace. One of the bands Magnolia Electric Co is touring with right now is Vancouver’s Ladyhawk, whom I saw on their own last weekend. They’ve just made another MP3 from Ladyhawk available, and I gotta say this album is really really growing on me. Check out the Golden Smog family tree, in ginormous JPG form. Exclaim! also has an chat with Smogger Kraig Johnson. And completely unknown to me till yesterday, Land Of Talk will be playing the Drake next Thursday night – August 3 for those of you without a calendar handy. Awesomeness. I may or may not be in town but if I am, I will be there fo’ sho’. The Ghost Is Dancing, whom Chart talked to about their new EP, and Foxfire Forest open. Tickets $8 advance, $10 at the door. And to file under “wha?”, NOW is saying that Gnarls Barkley have been added to the Sonic Youth/Go! Team show at the Kool Haus on August 8 despite having their OWN show there on the 9th and playing the Virgin Festival on September 9. To say nothing of the fact that Sonic Youth tickets are cheaper than the Gnarls Barkley ones… methinks either someone in the listings department has their wires/dates crossed. Bradley’s Almanac has the whole of Camera Obscura’s show in Boston back in July 6 available to download. Brad rules the school – whoops, wrong Scottish twee-poppers. Separated at birth – Bob Dylan’s Modern Times and Luna’s Hedgehog/23 Minutes In Brussells 7″. The joys of stock photography brought to you by the Galaxie 500 mailing list. And in the me me me department – The New Music was at my apartment yesterday shooting an interview with yours truly. It will be a short segment but if/when it airs (perhaps next month) I will get it up on YouTube, providing I don’t come off too dorky. It was an interesting/different experience, that’s for sure. And the new issue of Wonkavision also has an interview with myself and some other music bloggers in a piece about workable solutions for the situation in the Middle East. It’s riveting stuff.